• Purchase point solutions from an array of solution providers that are installed on each device (desktops, laptops and mobile communications platforms) to protect employees and the enterprise from hackers and malware. Companies are increasingly opting to turn their security needs over to experts who offer managed Software-as-a-Service (SaaS) solutions. Their benefits—reduced capital investments and operating costs, simplified IT, and the ability to streamline and improve information exchange among partners—seem particularly appealing to businesses. This three-part report describes how all businesses can benefit from SaaS services, in particular the variety of services that make up hosted services from Symantec. 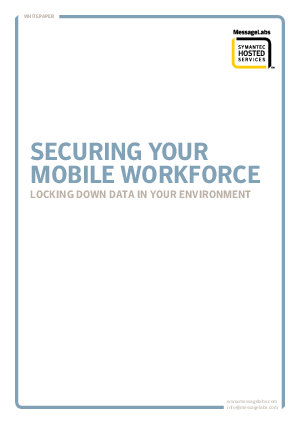 It also provides advice, best practices, and insight on how to create security and management policies for a distributed workforce.